Sprinkler systems are viewed by homeowners as a luxury home improvement project. There’s no doubt that they’re convenient, giving you back hours of your leisure time during beautiful summer evenings. Few homeowners realize though, that they are also better for your lawn. Despite a careful hand and a good internal clock, there’s no way a human lugging a garden hose around the lawn can deliver a consistent, uniform amount of water to their lawn. Of course, to get these advantages you must have a properly designed and installed sprinkler system. This involves a lot more than laying pipe and installing sprinkler heads. Zones should be created to tailor how each section of your lawn receives water throughout the day. 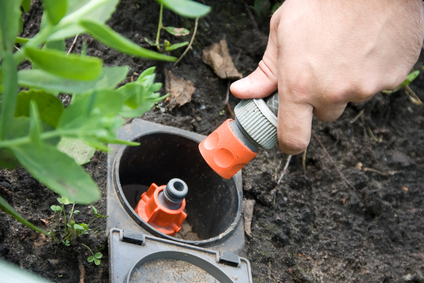 Valves must be used to keep each sprinkler head from draining the water pressure to ensure the last sprinkler head in each zone sequence delivers the same amount of water as the first. The heads themselves must be precisely placed on your lawn to create head-to-head coverage and uniform irrigation pattern. Without this type of meticulous design, you might as well still be lugging the garden hose around your yard. Give your yard the gift of green!